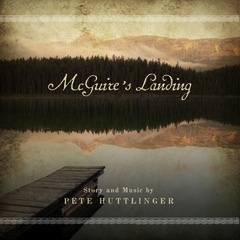 McGuire’s Landing Story & Music by Pete Huttlinger. After years in the making, Huttlinger is set to release McGuire’s Landing on August 20, 2013. This project includes a 15-track CD with a 52 page narrative. In 2004, Huttlinger recorded “McGuire’s Landing,” as a track on his album, The Santa Rita Connection. The song, with its wistful Anglo-Celtic overtones and delicate picking patterns, soon became one of the most-requested tunes in his shows. For years he considered building a complete concept around the song. Soon he began composing a cycle of songs and writing an accompanying prose story about the bold Irish immigrant S. McGuire, who arrives in Boston just as the Civil War is ending, and who, with his new-found friend, Artemus Jackson, heads West to claim territory on which to construct his own corner of the American Dream. Huttlinger began recording tracks for McGuire’s Landing—the album—in 2006. But, on November 3, 2010, Huttlinger suffered a near fatal stroke that for days paralyzed his right side and stole his speech. Exerting enormous effort, he slowly pushed back the paralysis and was even playing guitar again when he was devastated by end-stage heart failure, the result of a cardiac abnormality that had plagued him since childhood. So serious was the affliction that he had to be air-lifted from Vanderbilt Hospital, near his home in Nashville, to Texas Heart Institute in Houston, where he was outfitted with a heart pump (known as a VAD—Ventricular Assist Device) and spent the next four months in the hospital recovering. I believe I survived a stroke and heart failure so I could complete this project. I had been so busy making a living with other musical projects that McGuire’s Landing had taken a backseat. Then I landed in the hospital for all that time. I thought if I could just get healthy enough again to play, maybe I could finish the album.” And that’s exactly what he’s done. He recorded the final four songs for the album and finished writing the book after he was released from the hospital over a year ago – Pete Huttlinger. Joining Huttlinger on the album is a range of top-notch vocalists and musicians including Herb Pedersen, of Desert Rose Band renown; accordionist Jeff Taylor, from Rounder Record’s The Time Jumpers; violinist Andrea Zonn, of James Taylor’s band; bassist Byron House, who tours with Robert Plant, Emmylou Harris, Sam Bush and Rodney Crowell; L.A. vocalist Mollie Weaver, pianist Chris Nole, and a number of Nashville’s finest symphonic musicians. Four of the songs—“The Ghosts From Below,” “The Blessings Of Winter,” “Here Comes The Cold” and “Falling”—have lyrics that both forward the narrative and stand alone as complete compositions. In the remaining numbers, one can hear jigs, reels, waltzes and hoedowns of the kind that gave such color and sense of place to Aaron Copland’s Appalachian Spring. Huttlinger’s guitar stylings here are a virtual “slide show” of moods and emotions, flowing un-tremored from foreboding to frolic, anticipation to euphoria. Huttlinger has become widely known as one of the most awe-inspiring acoustic guitarists in the world. He has performed at Carnegie Hall numerous times and was invited to participate in Eric Clapton’s Crossroads Festivals. As a sideman he has performed with John Denver, LeAnn Rimes, John Oates, and many others. Huttlinger has recorded on his own Instar label, Steve Vai’s critically acclaimed Favored Nations label and Windham Hill. In 2000 he won the respected title of National Fingerstyle Guitar Champion. Currently the album is available for pre-sale through his website www.petehuttlinger.com.